Paul Carbo was born February 10, 1955 in Baltimore, Maryland. He grew up one of eight children and went to school through college in the Baltimore area. After school, he worked in a commercial art studio before getting a job as a graphic artist/ illustrator at the Baltimore News American in 1979. in 1983, he moved out west to take a job at the Reno Gazette Journal, then onto the Orange County Register in Southern California in 1987 and Los Angeles Times from 1998 to 2000. A big turning point in Paul's life was when his father passed away. 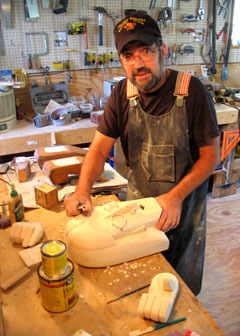 It ws then that Paul decided to move back to Maryland, say good bye to the graphic art biz and start a new career working with his hands instead in front of a computer. His work gained immediate acceptance for its uniqueness, creativity and whimsy. The fact that all his pieces are functional furniture satisfied pragmatists as well. He and Nancy now live on a farm in Virginia where they tend to their horses, cattle and sheep.